This historic spa and bath house is open year-round and is very popular among locals and tourists alike. 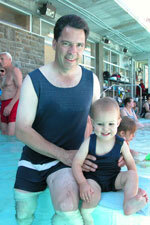 The outdoor pool is spring-fed with temperatures usually around 38-44 degrees Celsius (104 degrees F). While your children are in the wading area, you can just look over and admire the beautiful and rugged Mt Rundle. The change rooms have heated floors and include a family change room. Also located at the Upper Hot Springs are a gift store, restaurant and snack bar. ...my favourite time to go to the Upper Hotsprings is on a frosty winter day. The Banff Upper Hot Springs recently celebrated their 75th birthday and Marcel was there to celebrate!! For those of you who do not have a car, getting up the mountain can be more of a challenge. Of course you can walk or bike, but many people decide to take a taxi, or, if available, a Brewster Transportation shuttle bus. If you are fortunate enough to stay at the Rimrock Resort Hotel in Banff, you can just walk across the street and enjoy! My favourite time to go to the Upper Hot Springs is on a frosty winter day. Imagine experiencing a water temperature of +40° and an air temperature of -30°! A soak in these mineral-laden waters will take away any tension and do sore muscles a world of good after a day of skiing, hiking or shopping! If you forget your swim suit, you can always relive history and rent one from the 1920's!! Here we are looking great in our old-fashioned suits and having a fun afternoon. Looking for more hot pools? Plan to visit Miette Hot Springs in Jasper National Park, Alberta and Radium Hot Springs in Kootenay National Park, British Columbia. Family rates admit two adults and two children. Adult (18-64 years); senior (65 years and older); child (3-17 years). All rates include GST. Yes, the Banff Upper Hot Pool can be rented by the hour - but only before or after regular hours of operation. The Hot Pool, 1 to 60 persons is $269.80 and each additional person is $3.40. Didn't bring your suit or need a towel? Don't worry, the prices are reasonable! Last admission is 1/2 hour before closing. The Banff Upper Hot Springs are open year-round, however there are periods of closure for maintenance. Hours vary according to season and holiday periods. Fees listed are valid until March 31 2012. IT IS ALL ABOUT WELLNESS! 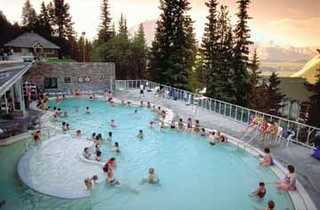 The Banff Upper Hot Springs also has a Day Spa for you to take advantage of. At the "Pleiades Massage & Spa" treatments include aromatherapy, facials, massage, Shiatsu, reflexology, hot stone and Reiki in private rooms with great views.